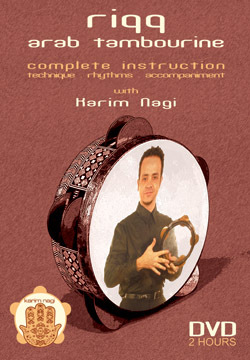 Karim Nagi is a native Egyptian musician and an accomplished performer and teacher of the RIQQ (Arab Tambourine). In this DVD Karim provides a detailed and vivid 2 hours of instruction. Karim explains proper technique, performs rhythms, and demonstrates how to accompany other musicians. Karim guides the student from the very beginning with grip and tone generation, all the way through advanced techniques and rhythms. This pure Arabic technique and style can be effectively applied to general Middle Eastern, Mediterranean and Medieval European styles and music. The RIQQ is a versatile instrument with endless possibilities for color and expression. This DVD is the first definitive video tool that presents this unique instrument in its original, authentic usage and method for all levels. 1. Introduction - the system and approach to playing the traditional Arab style and method. 2. Open Position - a.k.a. "Cabaret Style" using cymbals (examples ayyub, masmudi & malfuf). 3. Closed Position - a.k.a. "Classical Style" using skin (examples ayyub, masmudi & malfuf). 4. Loud Position - rhythmic shaking and rocking for an energetic volume and pace. 5. Switching Positions - going between each position seamlessly, to follow the music. 6. Rhythm Examples - from the simple to the complex: (wahda, york, muhaggar and more). 7. Accompaniment - Samai, Andalusian, and Qudud with oudist & singer Aboud Agha. 8. Solo by Karim Nagi. First of all I would like to say SORRY for my bad English. Second of all I would like to bow before you and thank you for a great time I spend watching your DVD. I am a beginner with a big ÒBÓ in riqq. I have some videos and a few dvds I bought to understand this amazing instrument but the only one that gave me this much fun and wisdom is your Riqq instructional dvd. Great stuff. I have watched lots o musicians playing Arabic music but I must say watching you doing accompaniment or playing solo is just brain relaxing. My name is Mohammad Mghaïeth, I'm a tabla (darbouka) player and I live in Paris. I recently wanted to begin playing "riqq" but I have no time to take some lessons in order to learn the right hits and hand positions (I have no problem for the rythms thanks to the tabla). By chance, I found your intructional "riqq" dvd on internet and I bought it. After viewing it, I want to congratulate you for the quality of this technical support and for the clearness of the instructions. I'll will advise some friends to buy it. I'm happy to see that there are some people like you who try to use modern supports (dvd) to allow people in the occidental side of the world to know this magnific instrument and learn playing it. There's a lack of this kind of initiative in our oriental countries!! I just wanted to let you know how excited I have been to study riqq since my purchase of your instructional DVD. It is the definitive instructional video! Every aspect of your DVD -- from your descriptions of how to hold the instrument, to your examples of exercises for the different techniques and rhythms, to your demonstrations of accompanying, to your inspiring solo -- are so clear in structure and format, that I feel as though each time I view it, I am receiving many hours of private instruction and a window to many "secrets" to playing well.